You’re looking for a new computer – what’s your best bet? Naturally our advice when building a new computer rig is to build your own allowing full customisation of every component not to mention being able to purchase parts separately in order to get the best possible deal. However, building a full system requires a fair amount of time: planning the spec, buying components and finally putting the whole thing together. 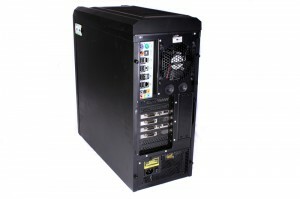 OverclockersUK has long since been a highly respected name in the online computer market selling all manner of components, peripherals and full systems. 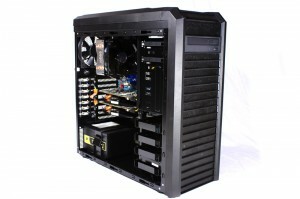 Today’s review focuses on one of their most popular gaming rigs: the Titan Goliath. Latest Intel Core i7 technology to push the boundaries of PC performance. 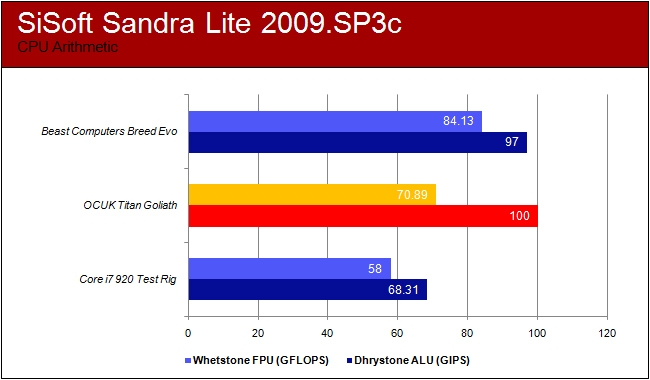 Selection of the highest performance ATI & Nvidia graphics card options. Low noise allowing excellent movie playback through HDMI / DVI. Energy saving components keeping running costs down. Only the highest quality components ensuring the highest levels of reliability. As expected, the rig arrived in the retail packaging for the Lancool K62 case with the polystyrene ends preventing any damage during transit. It may seem a pretty obvious point to make but it’s still good to see the Goliath safely packaged: after all a £1000+ rig arriving damaged before being used doesn’t instil oneself with confidence. In terms of size, the Lancool PC-K62 housed rig is nicely proportioned: the chassis is a little smaller than many competing gaming enclosures but the reduced dimensions haven’t impacted greatly on the spaciousness of the internal layout. As mentioned previously, the customisation available for the Titan Goliath is very impressive with an array of components to be chosen depending on a user’s requirements. 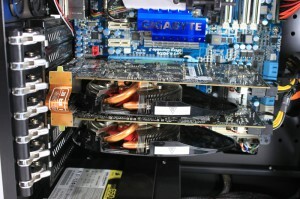 The rig we reviewed featured 2 x ATI Radeon HD 5770 1024MB CrossfireX graphics cards, a 1TB Seagate Barracuda 7200.12 and a pre-installed copy of the Windows 7 64-bit OEM operating system. As a result of these upgrades the starting price of the OCUK Titan Goliath set at £854.99 (inc. VAT) was increased by the order of around £450 to £1294.97. Even with these notable additions, the graphics card and solid state drive options can still be adjusted to optimise performance further. OCUK’s work is not completed after simply building the system though. On inspection of the internals of the Lancool chassis, it is obvious that the cable management has been meticulously dealt with. Naturally the aesthetic appeal is heightened as a result but there is a cooling advantage too: by tucking away all loose cables, the airflow produced by system fans is not deflected or blocked and so both intake and exhaust are able to work more effectively. The Intel Core i7 920 processor has been moderately overclocked from a stock speed of 2.66GHz to 3.40GHz using a BLCK frequency of 170 with the 20x multiplier. Although this is a reasonable overclock, there is definitely more scope for higher clocks up to about the 4GHz: perhaps OCUK’s reason for only pushing the frequency to 3400MHz is that the CPU cooler is not huge and so more cooling may be required to achieve rock solid stability at higher levels. Another point, to Overclockers’ credit, is their decision to update many of the components used in the production of the system. Since the launch of Intel’s i7 930 processor (essentially the successor to the 920), the Titan Goliath has used the i7 930 overclocked to 3.60GHz as standard. Moreover, new graphics and hard drive hardware are added to the optional upgrades so as to ensure the Goliath system is always incorporating the latest hardware. In terms of the noise, the rig is relatively quiet – a low hum is audible but it’s not very loud at all. 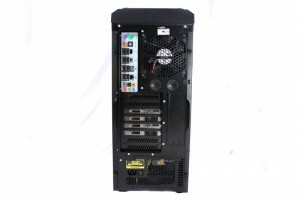 Indeed, the combination of the Akasa AK-967 Nero HDT processor cooler and blue LED case fans seems to work very effectively. Unfortunately, the accessories of components utilised in the rig are not bundled alongside the system which is a little disappointing. If you’re not planning on upgrading the rig or adding extra components down the line, this isn’t a problem. 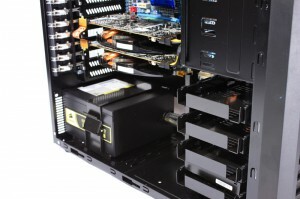 However, small bits and pieces like SATA cables and power supply cabling are very useful to add in extra hard drives or a new graphics card. On the whole, the rig looks to be impeccably built without any minor faults to be seen. 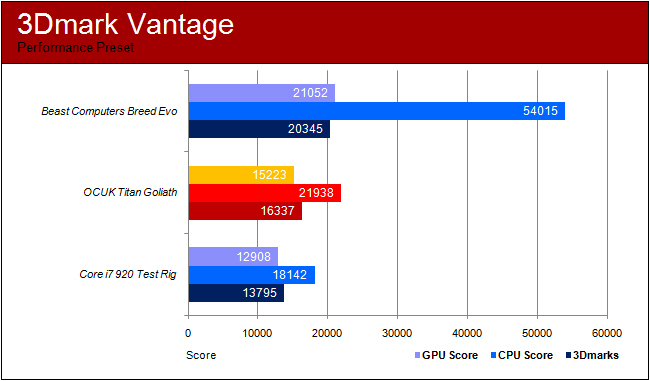 In order to investigate the levels of performance achievable by the Overclockers Titan Goliath system, we’ve put it up against our own Core i7 920/X58 test rig and the Beast Computers Breed Evo rig. The testing procedure will consist of a series of benchmarks. For every benchmark program, tests are conducted three times and an averaged result taken and displayed in the review. In the event of very inconsistent results, the test is re-run until concordance is obtained. 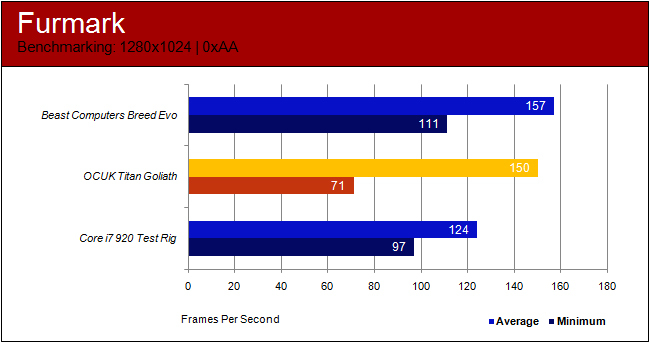 3Dmark Vantage is a computer benchmarking tool creating by Futuremark and designed to test the DirectX 10 performance of a graphics card. A 3Dmark score is obtained from the test providing an overall measure of a system’s 3D gaming capabilities based on real-time 3D graphics and processor tests. 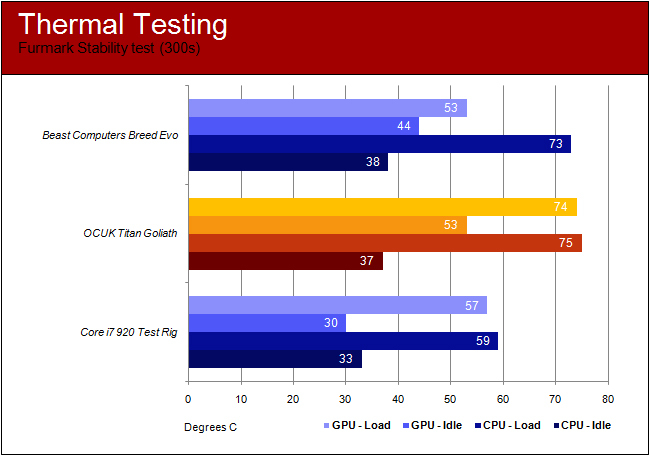 Specific GPU and CPU scores are also calculated from the test and it is these, alongside the 3Dmark score that are recorded in this article. Furmark is an intensive OpenGL Benchmark which uses fur rendering algorithms to obtain a measure for the performance of a graphics card. The fur rendering process, when adapted, is also extremely good at overheating the GPU enabling the application to be used as both a benchmark and a stability and stress test. The benchmark has a range of variables that can be adjusted to test the cards at different levels that are similar to most games: resolution, MSAA, duration and so on. Note that a graphics card compliant with OpenGL 2.0 is required. For this process, benchmarks were run for 60 seconds at three different levels; both minimum and average frame rates were recorded. Far Cry 2, the sequel to the initial Far Cry first-person shooter, continues the franchise from Crytek which started in 2004. Created by Ubisoft, Far Cry is now entirely independent from its creators with its own Dunia graphics engine. The engine is comparable to CryTek’s CryEngine 2 used on Crysis and supports a range of technology including dynamic weather, full day/night cycles and non-direct lighting. The title supports both DirectX 9 and DirectX 10.0 under XP and Vista respectively. 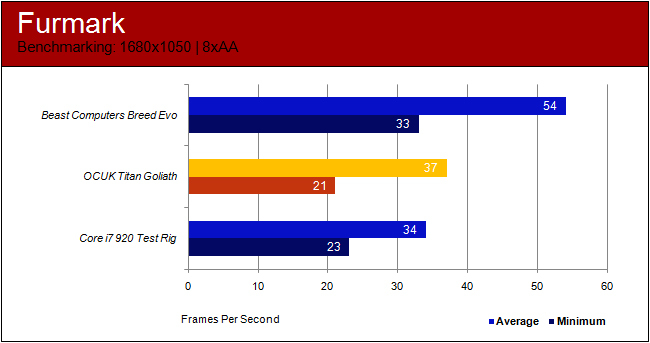 Testing was done through the internal benchmarking tool with minimum and average frame rates taken. To test both the thermal capabilities of the cooler and the power consumption of the card, the stability and stress test (Xtreme Burning Mode) from the Furmark benchmark suite is run for 5 minutes (300 seconds) with the temperature and power consumption values recorded at the end. Temperature readings are taken from Furmark with a power metre at the wall taking the wattage for the whole system. 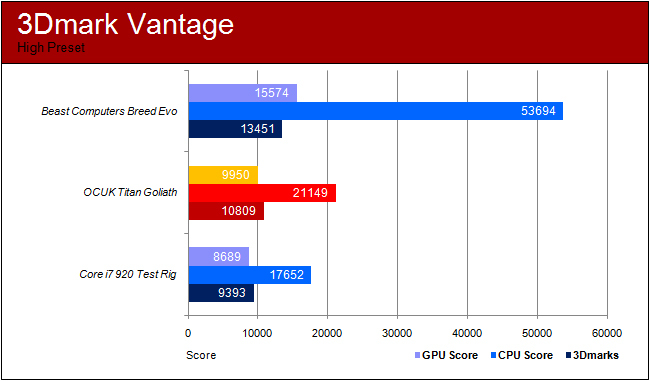 Generally speaking, the OCUK Titan Goliath slots in between our Core i7 920 test system and the Breed Evo rig from Beast Computers and looking at the specifications and CPU clocks, this is about right. The Breed Evo is a much more expensive system (around the £2500 mark) featuring a full water cooling loop for the GPU, chipsets and processor allowing for a far greater stable overclock on the i7 920 CPU. The Goliath, clocked at a lower 3.40 GHz is obviously a little slower in the CPU arithmetic and multimedia tests but it’s not too far away: the difference coming to approximately 5-10%. 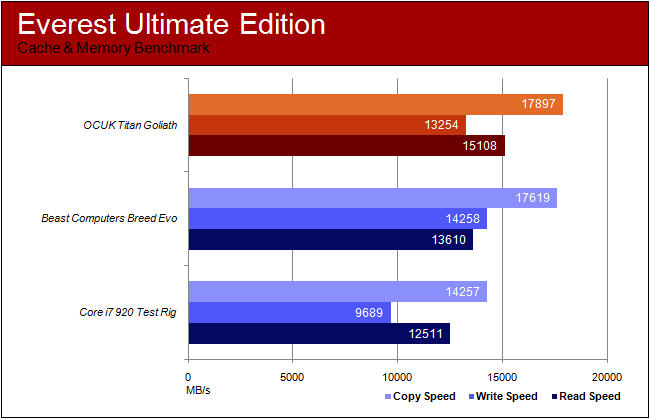 The memory for the Titan gamer rig is perhaps a little better than its rivals though scoring higher on the Everest benchmark, albeit apart from the write speed, and a very similar result for memory bandwidth. The real star of the rig appears to be the dual CrossfireX Radeon HD 5770’s achieving higher frame rates over the 5850 used in our test rig if not quite matching the performance of nVidia’s single-PCB dual-GPU card – the GTX 295. 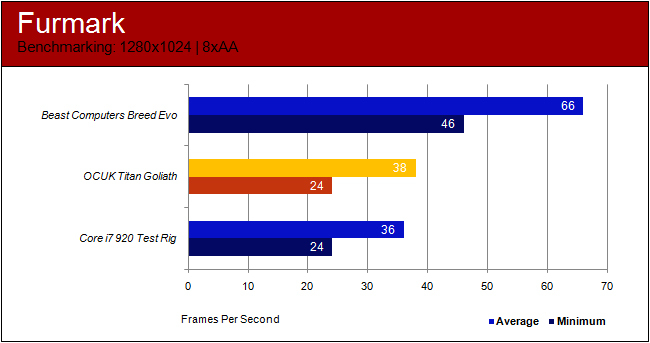 Most definitely, all settings tested for Far Cry 2 will play very smoothly and even at maximum graphic stress levels, the Titan Goliath is able to churn out a healthy 50 frames per second. The downside to dual 5770s comes in the form of power consumption: the OCUK rig clocks in at 60W, higher than the i7 test rig which utilises a single HD 5850, at 320W. Moreover, even at idle, a 40 Watt difference is seen. 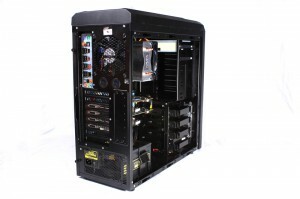 Finally, looking at the temperature readings, the readings are undoubtedly higher for the Overclockers Titan Goliath but they are still reasonably good considering the nature of the air cooling – a relatively small HDT (heat-pipe direct touch) processor cooler and the reference coolers on the graphics cards. The downside to the Akasa AK-967 cooler is the overclocking headroom available as the temperatures start to really heat up once 3.6 – 3.8GHz is reached. In our experience 3.8GHz was realistic but required a fair bump up in Vcore voltage that resulted in temperatures in excess of 80 degrees Celsius. Therefore, if you’re looking to overclock up to 4GHz, a cooler with a little more beef might be required. All in all, the performance levels are very strong. Naturally, they’re not quite up to the level of the Breed Evo but at double the price tag, you wouldn’t expect the OCUK to compete at all: it does, making the Overclockers rig a much more affordable option. As an all-round product, the Overclockers UK Titan Goliath certainly packs a punch: both visually and in terms of performance the full system is a very capable gaming rig easily capable of supporting new DirectX 11 games at high settings without so much as blinking. 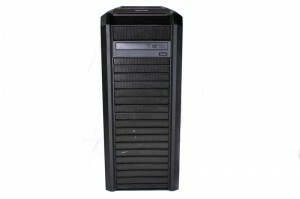 The X58 platform delivers once again with the overclocked i7 920 combined with 6GB tri-channel DDR3 memory working together exceptionally well as past experience has pointed towards. 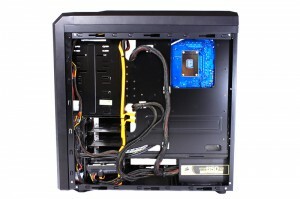 There’s still room for upgrades though with the drop down menus found on the OCUK webpage offering a selection of high level gaming hardware to be incorporating into the rig such as SSDs, more powerful graphics cards and extra storage. Naturally, the price point is higher than if you go it your own and build from scratch but there’s obvious reasons behind this besides simply building the system. For starters, the cable management is absolutely meticulous with all loose ends tidied away behind the motherboard tray. The operating system and BIOS setup have been accounted for too leading to an overclocked core speed of 3.4GHz. Essentially, it’s just a case of plug the power cable in and you’re off: no installing or messing around in the BIOS required! Indeed, buying a pre-built rig saves you time, money and effort but bear in mind the price tag reflects this. Going it alone has several other advantages: full customisation and choice of hardware that isn’t limited to a drop down menu and the ability to buy different components from different retailers so as to get the best possible price. 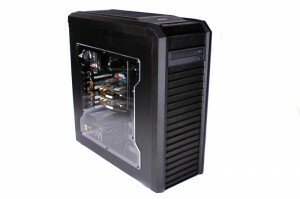 Still if you’re not interested in the building process or simply don’t have time; the OCUK Titan Goliath is as good a (pre-built) system as you’ll find for the corresponding price tag with all the traits of a top quality computer: aesthetics, build quality, quiet operation and plenty of gaming firepower. Overclockers UK have informed us that the Titan Goliath rig now features an Intel Core i7 930 overclocked to a higher 3.6GHz giving a small performance boost and making the rig better value for money. 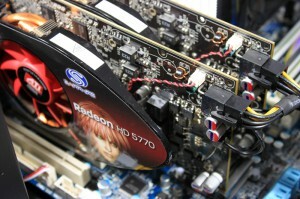 Thanks go to Overclockers UK for providing the system for review.